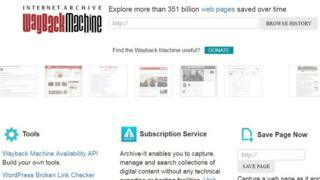 The Internet Archive has been hit with 550 "false" demands to remove "terrorist propaganda" from its servers in less than a week. In a blog, the website's Chris Butler said that it had received notices identifying hundreds of web addresses stored on archive.org as leading people to banned material. Some of the requests referred to material that had "high scholarly and research value" and were not produced by terror groups, he said. Others called for the delisting of massively popular links that led people to "millions" of items. "It is not possible for us to process these reports using human review within a very limited timeframe like one hour," he said. He asked: "Are we to simply take what's reported as 'terrorism' at face value and risk the automatic removal of things like the primary collection page for all books on archive.org?" He said the Archive's experience did not bode well for impending European rules governing the use of copyrighted material.